The first quarter of 2005 was a rocky one for all markets. Yet the economy continued its respectable pace of growth during the quarter,and the unemployment rate continues to be low at 5.2%i . Bond market investors also saw falling prices and higher yields during the quarter. The Federal Reserve increased rates twice during the quarter, leaving the Fed Funds Rate at 2.75%, which is up 1.75% over the last 9 monthsii. Additionally, longer rates began to move back up during the quarter, with the 10 year Treasury note ending the quarter at 4.48%, up from 4.22%iii. This increase in both short and long term rates had bond price interest rates falling over the quarter. The effect of rising fuel prices has begun to show up in other prices, with “Core” inflation (excluding food and energy) up from 2.2% in December 2004 to 2.4% in March of 2005iv. While this index excludes fuel, it does take into account the fuel surcharges that airlines and other transportation providers have been passing through to their customers. Oil continued its upward climb, ending the quarter at $55.40, up 31% over the quarterv. This continued to propel energy stocks, which as a sector returned 17% during the quartervi. 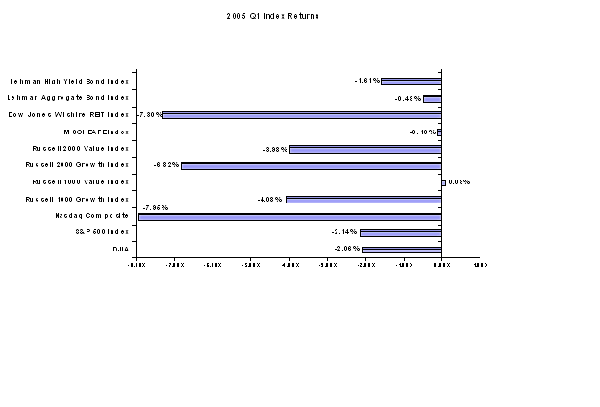 These returns were buffeted by the nearly 6% drop each in the Information Technology, Telecommunications, and Financial Services sectorsvii. International Equity markets continued to experience positive returns, but when those returns were converted back into dollars they were substantially reduced if not eliminated, due to the dollar appreciating over 4% against the Euro and the Yenviii. The strengthening of the dollar had the potential to whipsaw investors who may have over allocated to non-US markets, having become enamored by the extra return boost provided by the falling dollar over the past few years. As discussed earlier, while performance in the markets was disappointing for the quarter, the economy continues to grow at an attractive rate. GDP Growth came in at 3.8% for the 4th quarter of 2004, and estimates for 1st quarter 2005 growth are around 3.8%ix. Unemployment continues to fall with the economy generating nearly 175,000 new jobs per month. So, while the markets may have reacted in the short term to rising oil prices and interest rates, the economy remains strong and growing. If the economy continues to grow as it has, we can expect the market to ultimately re-allocate capital to those companies which are part of this growth story. In markets like we experienced during the First Quarter, we are again reminded of the importance of owning a properly diversified portfolio, and how important it is to have a capable, experienced investment team to navigate us through difficult times. As long term investors, we know that these periods arise from time to time, and that what is important is to stay the course, remain focused on our long-term goals and objectives, and resist the temptation to overreact to inevitable short-term market movements.